If you're looking for animal lover gifts, you want to give more than just a present with an animal on it; you want to provide that special someone with a gift that they can really use and treasure for a lifetime. That's why our Indian Elephant Jewelry Holder is the perfect choice of animal lover gifts for any occasion. 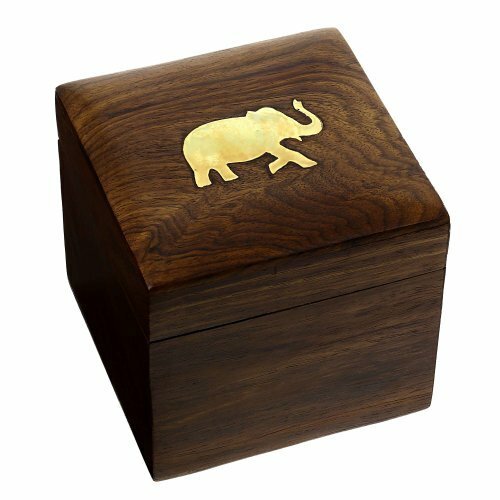 This elephant jewelry box is both decorative and practical and sure to be appreciated by anyone who loves animals. The Indian Elephant Jewelry Holder is a hinged small wood box fabricated out of sheesham wood, a variety of that is prized for its strength and for its beautiful grain. The natural finished wood is finished with a lovely brass inlay of an elephant. Because the elephant is inlaid, it will never become loose or fall off the way that glued-on charms might on another elephant jewelry box. The elephant jewelry holder makes a handsome decoration and can be used for storing other odds and ends, including coins. Measuring 4 inches in length by 4 inches in width by 3.5 inch in height, the Indian Elephant Jewelry Holder is the perfect small wood box for displaying anywhere from the dresser to the nightstand to the vanity. Square designs like this one are especially handy for use as jewelry boxes for necklaces, as they allow you to lay the chains out flat in order to prevent knotting and tangling. When you give the Indian Elephant Jewelry Holder as an animal lover gifts idea, you'll be giving a present that is of remarkable quality. Each of these jewelry boxes for necklaces, rings, bracelets and earrings is completely handcrafted by an artisan from Saharanpur, India. The woodworkers from this region are known throughout the world for their skills, and this small wood box is a perfect example of the quality of their workmanship. Choose animal lover gifts that are sure to impress and offer years of enjoyment for that special someone. Order the Indian Elephant Jewelry Holder for any occasion!